High On The Hog: No Cure Like Travel? 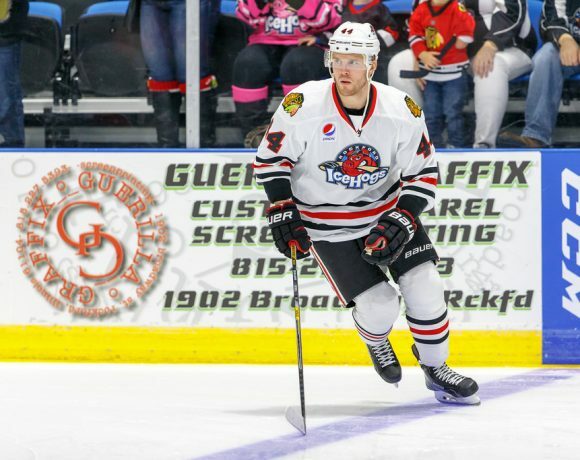 The Rockford IceHogs have put in a lot of travel miles on the road this season. What’s two thousand more this week? After dropping two of three games this past week, Rockford is embarking on its last road trip of the regular season. For their sake, I hope their mode of travel will be airplane. This is a frustrated bunch of Hogs. I’d hate to think of Ted Dent threatening to turn the bus around. Here’s a fun little quirk in the IceHogs schedule, courtesy of the AHL. 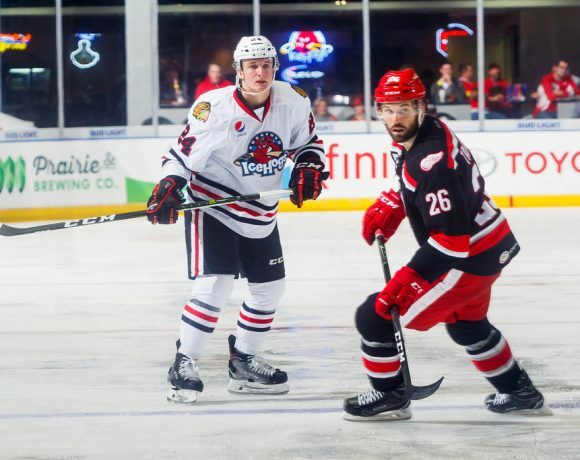 Rockford has four games in six days, all on the road as part of a five-game jaunt. Things get underway Tuesday with the first of back-to-back games in Charlotte. Following that, Rockford will travel all the way to Manitoba for Saturday and Sunday games with the Moose. Oh…and those games? They’re both 2:00 p.m. starts. The Hogs just snapped an eight-game road losing streak in Chicago this past Tuesday. Two of those eight defeats came in Charlotte March 12 and 13. Rockford is visiting Manitoba for the first time this season; they dropped two to the Moose at the BMO back in February. The IceHogs stop over in DesMoines for an April 13 date with the Wild before returning home for the last two games of the regular season. Coming to Rockford on the season’s last weekend are Grand Rapids (April 15) and Milwaukee (April 16). Rockford had a chance to make hay this past weekend with two of the bottom feeders in the Western Conference. However, they lost to San Antonio and Iowa, managing just a single point when four points were definitely attainable. Friday night, the IceHogs led San Antonio 2-1 late in the second period before allowing the equalizer with 20 seconds left in the period. They then wilted in the final 20 minutes as the Rampage buried Rockford with three goals. Rockford came out with a bit more snarl on Saturday but wasn’t able to top the last-place Iowa Wild. In the last ten games, the Hogs are just 3-5-2. Saturday wasn’t the result Dent was looking for, but there’s a little bit to build upon with a tough stretch to close out the regular season. Things haven’t been going so hot for the IceHogs of late, so let’s belch out some stats that might be of interest. Rockford tops the AHL leaderboard in two catagories. Ryan Hartman (who hasn’t played since March 24) leads the league with 40 minor infractions. Mike Liambas (in just 38 games) leads the AHL with 18 fighting majors. Way to go, guys! The return to the lineup by Liambas in December has caused a predictable spike in the Hogs fight totals. Rockford is now sixth in the league with 54 fighting majors. They’re also the third-most penalized club in the AHL, drawing an average of 17.14 minutes of box time per contest. Rockford is killing those penalties at an 82.9 percent rate, good enough for 17th in the AHL. With a pair of shorthanded goals this weekend, the IceHogs have 12 on the year, which is tied for third in the league. Unfortunately, the power play has sputtered. It’s 28th in the AHL; the Hogs convert on just 14.2 percent of their chances. The IceHogs have not fared well outside of regulation this season. After coming out on the short end of a 4-3 Gus Macker loss to Iowa Saturday, Rockford is 3-9 in overtime and 2-4 in shootouts. Only three teams have a lower win percentage than the .278 posted by the IceHogs. Also of note; Rockford is 0-16-3-0 in the 19 games in which it has been trailing heading into the third period. They are the only team in the league not to have at least one third-period comeback for a win. Pierre-Cedric Labrie, who never had more than 14 goals in any of his previous eight AHL campaigns, notched his 20th of 2015-16 on Saturday. He’s behind only Mark McNeill (22) for the team lead in goals. McNeill (22 G, 19 A)has 41 points on the season, as does rookie Vinnie Hinostroza (14 G, 27 A), who is 12th among AHL rookies in scoring. Ville Pokka (8 G, 32 A) is in the top-ten among defensemen in points. 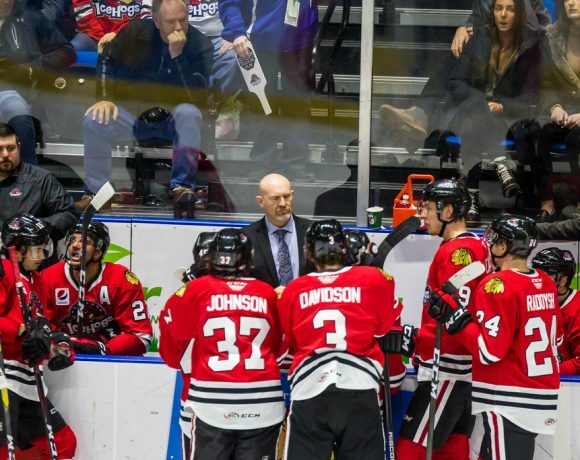 The IceHogs snapped an eight-game road losing steak at the Allstate Arena thanks to a late power play goal and Mac Carruth’s second career shutout. The game-winner came in the 15th minute of the third period, after Vinnie Hinostoza took Andre Benoit’s stick to his face. As the clock began to wind down on the man advantage, Hinostroza wove into the Wolves zone. Ryan Haggerty skated into the slot and received Hinostroza’s dish. Matt Fraser was also on the scene and heading for the right post. It appeared that Haggerty was intent on sending the puck Fraser’s way until he momentarily lost the handle. Regaining possession, Haggerty fired into the top-left corner past the glove of Jordan Binnington. Rubber struck twine and the Hogs had the game’s only tally at the 14:02 mark. Despite stopping all 23 shots sent his way, Carruth was only voted third star honors by the Wolves press box. Binnington was the second star, with Haggerty’s effort earning the game’s first star. The Hogs led twice in the first 40 minutes only to have San Antonio score three times in the third period. Rockford had trouble generating scoring chances all evening. They did take a 1-0 lead late in the first period when P.C. Labrie knocked in a loose puck in front of the Rampage net. After San Antonio tied the game with a Maxim Noreau goal 7:41 into the second period, the Hogs PK came up with a breakaway opportunity for Chris DeSousa. The play came together a minute into Vinnie Hinostroza’s cross-checking infraction. Nick Mattson broke up San Antonio’s attempt to establish possession in the Hogs zone. Kyle Baun collected the puck along the boards in neutral ice and managed to get it to DeSousa. Brandon Gormley of the Rampage had lost his stick and tried grabbing the Rockford forward. DeSousa eluded the big defenseman and beat Reto Berra to the stick side to put the IceHogs up 2-1 at 9:03 of the second period. San Antonio got the equalizer with 21 seconds remaining in the middle frame, then took the lead for good two minutes into the third. Out-shooting Rockford 17-7 in the final 20 minutes, the Rampage got goals from Garrett Thompson, Trevor Cheek and Borna Rendulic to get the best of the Hogs. The IceHogs managed a point but fell to 3-9 on the season in Gus Macker Time. The Wild got the scoring started 1:15 into the contest when Grayson Downing got behind the Rockford defense and got off a shot from the right circle. Starting goalie Drew MacIntyre got a real good look as the shot sailed over his glove and into the net for a 1-0 Iowa advantage. Later in the opening period, Pierre-Cedric Labrie took possession of a loose puck with help from Jonathan Carlsson and Nolan Valleau. Labrie drove to the Iowa net, beating Steve Michalek to pot the equalizer at 15:03. Rockford took a 2-1 lead in the middle stanza on a Ville Pokka power play goal. Pokka one-timed a long rebound of a David Rundblad shot past Michalek to give the Hogs the lead at the 5:50 mark. 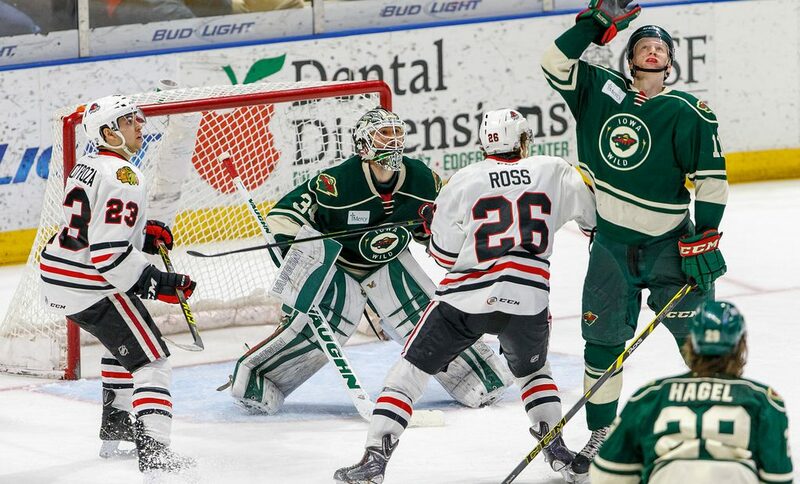 The Wild used goals from Kurtis Gabriel and Dylan Labbe to take a 3-2 lead until the Rockford penalty kill got another big shorthanded goal in the waning moments of the second. The play came via the stick of Mark McNeill, who broke into open ice to chase down a feed from Kyle Cumiskey. McNeill completed the rubber to twine hook-up to knot the game at three 18:57 into the period. Neither team managed to get a puck across the goal line in the final 20 minutes, necessitating a dry scrape and some three-on-three action. It lasted for 2:26, when Tyson Strachan put in a rebound over MacIntyre’s shoulder to end the game. For game updates, roster happenings and general opinions on the IceHogs as they push toward the playoffs, follow me @JonFromi on twitter.